George Selvie introduces himself to Foles. Both the Cowboys and Eagles came into this game scoring about 30 points a game and with pass defenses that allowed opposing QBs record breaking games. So this one had to become a shootout right? Actually this game turned into a lot of punts and a defensive battle. Go figure. Early in the season, Dallas found out they would not have their last year pro bowler and franchise tagged DE, Athony Spencer. If that wasn’t enough, they found out this week they would play the Eagles without their best defensive lineman DeMarus Ware due to injury. And this week Jerry Jones finally gave up on that hot mess Jay Ratliff by cutting the problem defensive tackle. Oh and Edgar Jones who Dallas brought in from KC to help provide depth at DE, was out with an injury too. To say the least, it was gut check time for the Cowboys young, inexperienced, and no name defensive front. I doubt many fans have been spotted walking around ATT&T stadium with “Selvie” or “Wynn” jerseys. When I saw the name Wynn involved in a sack today, my reaction was “who”? In desperation, the Cowboys also pulled up DE Jason Vega from the practice squad to help provide depth. Nick Hayden is another no name guy that Dallas turned to for a DT this year. And Drake Nevis has stepped up at DT too providing a lot of energy to that front line. Know any of these names before the season? Probably not, but if they keep playing like they did in this NFC East showdown today, these names will soon become common names among Cowboy fans. Jarius Jessereel Wynn was just signed by Dallas on Tuesday from the Chargers. How could he even learn the scheme or plays that quickly? 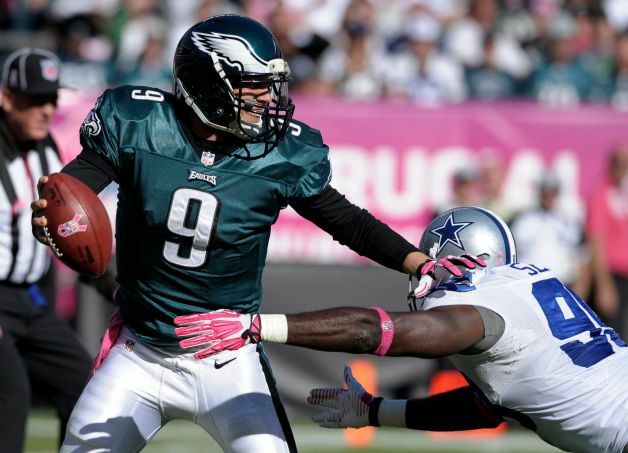 Defensive line coach Rod Marinelli must have told him to just line up and go get Foles. Because that’s exactly what he did by knocking Foles out of the game with a sack in the 2nd half. In the off season, I thought the addition of coach Rod Marinelli was a huge pick up for Dallas and I’m even more convinced now that he was a tremendous hire. He has done an outstanding job of getting the most from the guys he has to play with. Selvie had one solo sack and also was involved on the sack with Wynn, that made Foles head for the locker room early. Hatcher had a solo sack and hurried rookie QB Barkley who came in for Foles, resulting in an interception for Lee. What we saw today was that Dallas can win without Spencer, Ratliff and the aging Ware, on the defensive front. It has been over due for Dallas to get younger on the defensive line and all these things forced that to happen this week. It was kind of like the first day of a new defense today. Letting go of the past players and reaching for the future. And the results were pretty darn good too. If not for an INT by Romo, this defense was pitching a shut out today against an offense that can be a hand full. Some sceptics will point out the Eagles didn’t have Vick today but they had McCoy and last week Foles was NFC player of the week as their QB. Today this “no name” defense played as a unit and got after it and put the Cowboys all alone in first place in the NFC East. This entry was tagged Anthony Spencer, dallas cowboys, George Selvie, hayden, Jarius Wynn, Philadelphia Eagles, Ware. Bookmark the permalink. 2015 WEEK THREE NFL POWER RANKINGS: Jets soar into top 12.